My Mama gave me a bunch of real skinny asparagus, I thought about baking them with salt, pepper and olive in high heat for 10 minutes, but didn’t think it would go well with the other dish for tonight’s dinner, so instead whipped this up, real simple and tasty, although little girl didn’t particularly enjoy the texture of the tofu noodles, but she ate a bunch of the asparagus so I consider it a victory anyway! Mix the oyster sauce, brown sugar, chili garlic sauce and chicken broth in a small bowl, set aside. 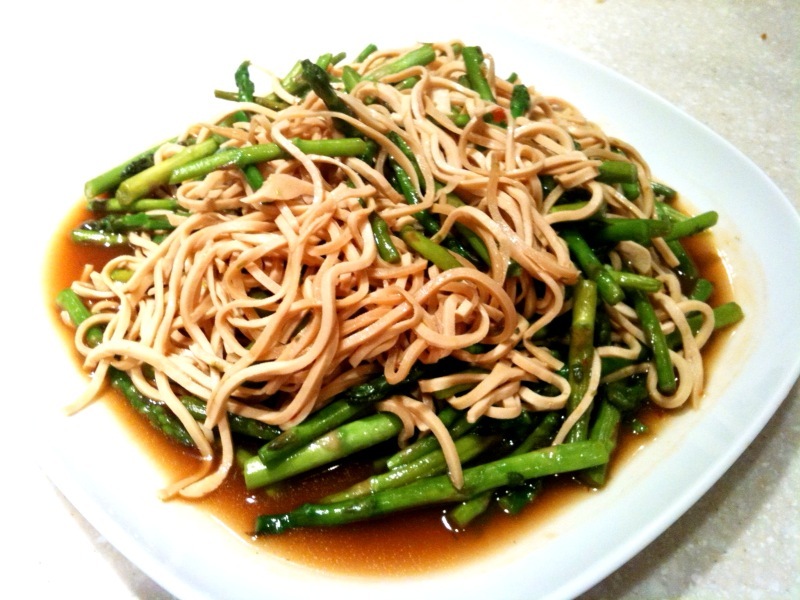 Heat up the oil in a wok, toss in garlic and stir fry until fragrant, add the asparagus a little of the sauce, stir quickly then cover for 1 minute, then add in the tofu noodles and rest of the sauce, stir fry and try to separate all the noodles, for about 3 minutes, do not over cook, asparagus should be crunchy. Serve with rice. For some reason, I don’t think I’ve had tofu noodles before? Maybe I have, but I just wasn’t aware! lol. It looks very goodd by the way. It’s funny that you wrote me tonight, because I was about to let you know I made your tofu dish again, my little girl was fighting over it with my husband, that’s how good it turned out! I gotta try your other recipes soon! By the way, I didn’t know how to address the tofu in the above recipe, after doing Google search, looks like people call it “Shredded Tofu”, came in a foil pouch in my local Chinese super market, hopefully you would be able to locate it at your area. Happy Cooking! I’m very happy to hear that the steamed tofu dish has been a hit!! Made my day! Just like you said some time ago, it would have been embarrassing if it didn’t turn out well lol. Anyway, keep up the amazing work, and I’m sure to drop by again and again!